During the Direct Fund Campaign, our goal is to raise $41,000 through volunteer contributions from parents and the Woodridge community in order to sustain the same level of excellence of the school’s faculty, programs, and support for students. Our suggested donation level is Silver Eagle at $100 per student and your donations are due by November 2 – 14. Every gift at every level makes a difference for our students. My name is Ju Lee, the volunteer Fundraiser VP for Woodridge Elementary School PTSA. I am writing to you about our Direct Fund Campaign running this November 2 - 14, our most important fundraiser for our school. This is a great opportunity for you to directly impact our students’ success at Woodridge Elementary School. Since we first opened the doors to our school in 1957, Woodridge Elementary School has transformed (literally with a brand new building!) and in the recent years, continues to experience unprecedented student enrollment. Through all these years, the school has been committed to provide the highest quality of education and invaluable experience for the students. Yet of course, it comes at a price. During the Direct Fund Campaign, our goal is to raise $41,000 through volunteer contributions from parents and the Woodridge community in order to sustain the same level of excellence of the school’s faculty, programs, and support for students. Our suggested donation level is Silver Eagle at $100 per student and we will collect donations during the Direct Fund Campaign (November 2 – 14). Our latest budget shows that we are expecting $108,200 of expenses for the current school that directly impact our students’ education at Woodridge Elementary School. 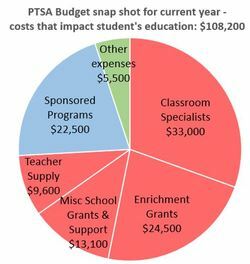 The largest category that the PTSA funds is School Grants and Support, making up 74% of the costs that directly impact students’ education. Classroom specialists fund additional classroom literacy support, math support, café supervision and before/after school supervision. Enrichment grants fund fieldtrips and various programs that introduce experimental and real-world experiences and applications. This year we are trying to streamline and simplify the message of our fundraiser in order to raise money directly for our student and teachers. With the current goal of $41,000 for the Direct Fund Campaign, we are targeting 90% or more of your money donated to the Direct Fund Campaign goes to the school grants and support. The Direct Fund Campaign relies on your financial generosity and all donation levels are greatly appreciated. As a donor to the Direct Fund Campaign, you can join the PTSA in supporting our students and teachers. Together, let’s make the investment, then stand back and watch our students rise to their fullest potential. The PTSA executive board is committed to the Direct Fund Campaign and have pledged 100% participation from our board. We are off to a strong start and looking to you for your strong support. I hope you will join me in supporting the Direct Fund Campaign by making your gift during the Direct Fund Campaign. We need a strong participation from the entire Woodridge community, including parents, alumni, faculty, grandparents, neighbors, and businesses. Every gift at every level makes a difference for our students.